Note ... if video doesn't seem to work, try reloading the page. The Automatic PocketMaker was first introduced in 2010 as a standard feature on Novaseal® ShadeSealers ranging in bar sizes from 168in to 294in. 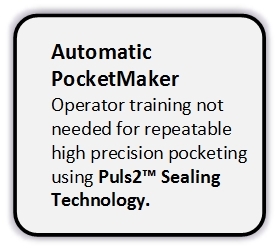 This Automatic PocketMaker soon became known for its repeatable high precision positioning accuracy. Additionally the Automatic PocketMaker can be used with less than full bar length shades as well as multiple shades of same or differing lengths all at the same time. It was and continues to be a breakthrough technological advancement in producing varying pocket depths in a production setting. Now this same precision technology is available on Novaseal® TableTop PulsSealers ranging in bar lengths from 40in to 126in with pocket depth from 1-5/8† inch to 4 inch. Click here for a list of additional customizable options available for TableTop NovaPULS™ Sealers. Note†: Pocket depth range is inclusive. Less is available at additional cost.